In July we went to Muan, a small city like Duluth, MN, for the Muan White Lotus Festival. Muan boasts the largest white lotus pond in Asia, at 330,000 square meters. Mike and I split a cab, driven by our neighbor, with two friends. The 30 minute ride cost us only $25. The festival grounds are beautiful, and the spreading lotus leaves are larger than chair cushions! We went on one of the first weekends, before the crowds set in, so ours was a quiet festival, more like a county fair. 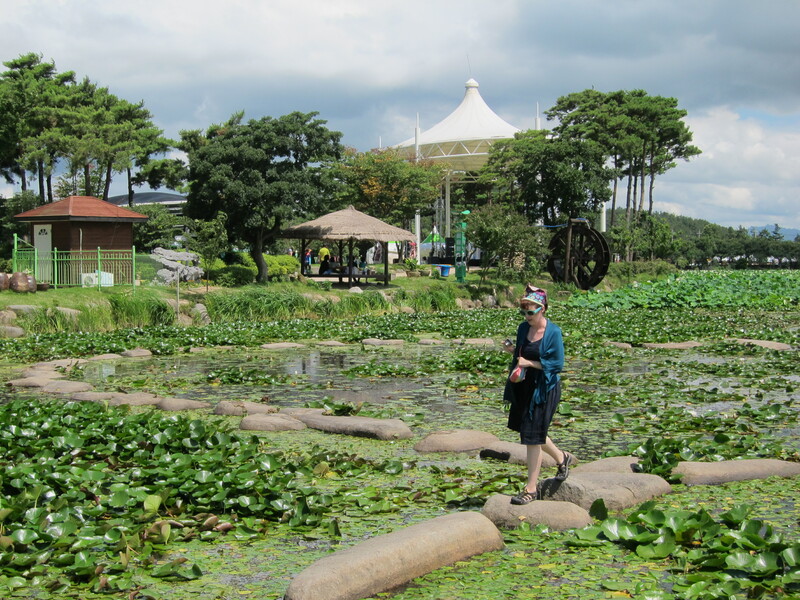 We walked around the lotus ponds, or across them on huge stones, and rode a swan shaped paddle boat through them. There were all sorts of regional crafts, foods, and music. We ate a delicious lotus panchang (Korean pancake), Mike, Meagan, and Shawn played traditional drums, and I made a decorative fan. It was good fun for about 3 hours. Then we caught a taxi home. Yes, there is a bus to Muan, but four tickets would have cost the same as all of us sharing 1 taxi, and we got door-to-door service. Strength in numbers! Here is a video of the crafts section of the festival. You’ll see, and hear, Mike, Shawn, and Meagan playing drums as I show you the cafe, where they cook the food in the open air, and chat with a slightly tipsy dad, see a clay goods seller (I liked the bowls, but they were $20 each), a booth with paper lanterns and fans and other hand made items, and a cool bark house. The next weekend we took a ferry out to Oedaldo, a small island about an hour’s ferry ride west of Mokpo. Oedaldo is famous for its sea-water pool and beautiful beach. It is nicknamed “Love Island” for its beautiful gardens and the beach where couples can spend time together, but it seemed more like a family-centered place, with kids running around eating ice cream and splashing in the pool, than it did a romantic get away. It was incredibly hot and humid, which is typical for a Mokpo summer, so we cooled off under a patio umbrella with a melon ice cream popsicle and a propel icee, and watched the families play. After we were sufficiently cool we wandered around the island. Mokpo is covered in 15 story high rises, so it was nice to see scattered one story homes and low, bucolic farms. It was in the mid-90’s and we were getting parched so we stopped in to a cafe for water. The owner took one look at Akasha’s beet-red face and told us to come enjoy the “air-con! Air-con!” It turns out they have a pension as well. We asked him if we could come back with the dog and he said “dog yes” as if that was no biggie whatsoever. I got his card. We are totally going back for a fall/winter weekend getaway. 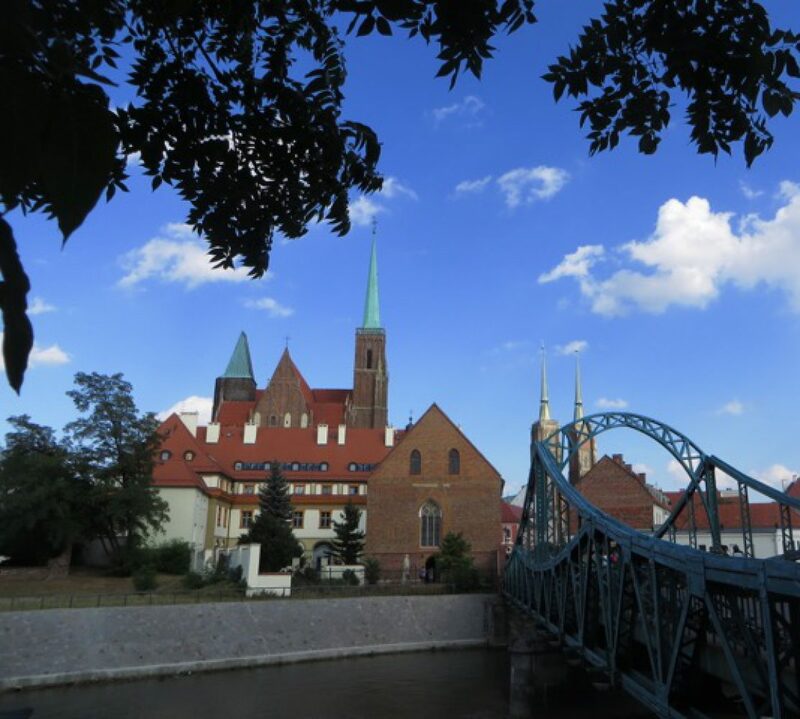 For us, Oedaldo was a mellow getaway with sandy beaches just a quick ferry from the city. We left around 2 pm and were home around 6. The weekend following that was the Busan girls’ weekend. A group of us took the bus to Gwangju (45 min), then over to Busan (4 hrs) for a 3 day weekend. Our mission was eating western food and going to the beach. Mission accomplished! Mokpo is a great city, but there is a serious lack of western food here. Good luck getting burgers and fries, burritos, breakfast food, or anything not Korean. In Busan, we stayed at a love motel for $6 each (4 or 5 girls to a room.) We had one western style bed, and the rest of us slept on Korean style ondol (floor) mats. As I’ve mentioned before, Korean beds are extremely hard (Our bed at home is just a box spring), so the floor mat is just as comfy as the bed. Beach culture is completely different. Sun bathing is undesireable here. People go to the beach, and in the water, completley clothed in 90 degree heat. They wear hoodies and baseball hats to shield themselves from the sun. Swimming is not a universal skill here, and it is startlingly different. The swimming area is only 122 m from beach to buoy. It is heavily patrolled by wet suit wearing life gaurds. People are side-by-side in their inflatable tubes. It’s just plain different. The water is warm, but thick with styrofoam beads from the markers for fishing cages. It was worth a visit, but I think I prefer my small island beaches. I chilled under the umbrella reading a book with a few of the girls for an hour before we headed off to the sauna. The other half of us walked the down the beach to a hill where they hiked around. Okay, this was my first Korean Sauna experience, I’ve gone monthly since then. It is AWESOME! The place that we went to the first time was by far the best I’ve had. You pay a $10 entrance fee and are given a key on a bracelet with your number. You put your shoes in a little locker with your key, then go on to the girls floor (in my case.) There you put your clothes and stuff in a locker, go take a shower and scrub from head to toe. Once scrubbed you can go in the mineral tubs and soak in varying degrees of hot or cold water, lay under a “waterfall” that will pound your sore muscles into submission, lounge, get a massage or a scrub. I got a scrub and massage and it was amazing. My Korean friend said that many people go monthly. When they were finished I felt as soft and smooth as a baby. Mike says: I can attest to her baby-smooth skin. And, I also enjoy the jimjibangs – the hot rooms are incredibly hot, like Hopi sweat-lodge hot, totally hot enough for mystic visions. After the sauna we went back to Gwangalli beach for “Mexican” dinner at a place called Fuzzy Navels. Somehow they managed to duplicate Minnesota Mexican food in Korea, how I’ll never know. It was a Mexican as my school lunches, but still a yummy attempt at Nachos, pork burritos, and margaritas. Oh, and grape jello shots! We woke up in the morning, grabbed pastries (another hard to find food item in the ‘po) and hopped on the subway to take the bus on home. It was a rock star weekend with excellent company. Mike and I returned in August with Jenni and Brian for our last weekend visit with them. We enjoyed the Busan aquarium with pretty cool jellyfish displays. We stayed in three differently awesome love motels. It rained the entire trip, so we only spent a bit at the beach, but we definitely enjoyed the view and the soft sand. Mike and I were in love with the public library at the beach (on the sand.) I really wish that it had stopped raining long enough to go on the ferris wheel. There are so many great places to go here that we had to cut this post in half. We’ll publish the other one in a bit. It includes our Chuseok trip to Jeju island. Maybe you can visit and take a side trip too.